Raleigh, NC (March 20, 2018) - Alien Skin Software today announced the release of the Exposure X3 Complete Workflow Update, the latest version of their non-destructive RAW photo editor. The award-winning Exposure combines powerful organizational tools and accurate photo processing into a single intuitive solution. Enhancements to this latest version make Exposure the ideal solution for handling the full photography workflow. Photographers can easily organize, edit, retouch, export, and print their photos using Exposure's efficient workflow. Exposure's intuitive design streamlines image management and backups. Its support of cloud-based storage enables multi-computer and collaborative workflows. "This latest update to Exposure X3 provides photographers with additional creative and organizational control, and handles their printing needs as well," said Alien Skin CEO Finley Lee. "Exposure's speed, stability, and power makes it the fastest way for photographers to bring their vision to life." Improvements to the color controls enable photographers to adjust hue, luminance, and saturation for specific colors. In addition, users can easily target specific colors in their image for detailed adjustments. Collections see several refinements. New images copied from a photo card are now placed in a Last Copy From Card collection. Optionally, when copying images from their camera card, photographers can choose to add images to any existing collections. Also, when creating a collection, it's possible to add any images that are currently selected. Keywords have been improved with the ability to remove all keywords from a photo and to add and remove keywords from a set. It's also now possible to import keyword sets from other applications like Lightroom. Exposure's watermarks now have new metadata options, a watermark preview in the Export dialog, and improved control when moving and rotating a watermark. Exposure's beating heart is its advanced rendering engine, which handles the demanding task of accurate film emulation and provides exceptional processing quality and performance. Exposure handles the most sophisticated edits. Its extensive library of customizable presets makes hundreds of iconic film looks and other styles available to photographers. Extensive editing, layering, and retouching tools make it easy to refine images, as well as to blend subtle or bold creative looks. All of Exposure's tools work together in a carefully designed, customizable user interface, resulting in a seamless workflow for a wide range of photographers. The Exposure X3 Complete Workflow Update is also the centerpiece in the Exposure X3 Bundle. This integrated collection bundles Exposure with Alien Skin's award-winning Blow Up and Snap Art tools to add high-quality upsizing and natural media special effects. It is available for $199. Owners of one or more of the current apps in the Exposure X3 Bundle can purchase for $119. It is free for current owners of the Exposure X3 Bundle. 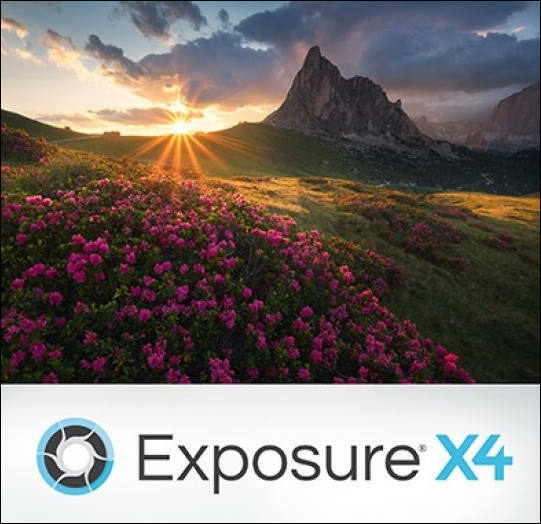 Raleigh, NC (April 2, 2019) - Alien Skin Software today announced the release of Exposure X4.5, a major update to Exposure X4, their award-winning, non-destructive RAW photo editor and organizer. Exposure's speed, stability, and unmatched editing and organizing tools make it the standalone solution that photographers rely on to master their workflow and create beautiful images. Exposure X4.5, which is free to all owners of Exposure X4, further expands Exposure's capabilities with significant new tools. LUT support opens up new creative possibilities for photographers. LUT effects, available freely on the Internet or produced by other photo and video apps, may be imported into Exposure, where they can achieve striking looks. These effects can be further enhanced using Exposure's advanced editing and layering tools. The redesigned Copy Photos from Card function displays visual previews of images at the source location, allowing photographers to quickly select the images they wish to copy, as well as select a variety of flexible source and destination options. Exposure's unique design differs from traditional photo editors by removing the need for slow imports, enabling photographers to begin their creative edits immediately after the image copy begins. Configurable keyboard shortcuts allow photographers to assign an editing, organizing, or navigating function to a selected keystroke. For those migrating from Lightroom to Exposure, an included Lightroom keyboard shortcut preset eases the transition. "Exposure X4.5 delivers features that are among the most requested by our customers and that make Exposure an even more powerful and complete editing and organizing solution," said Alien Skin CEO Finley Lee. Exposure began in 2005 as a film simulation plug-in for Photoshop, and was immediately embraced by digital photographers of all genres seeking to recapture the organic look of film. Exposure has since grown into a standalone, non-destructive editing and organizing solution that handles every stage of the photography workflow. Exposure's editing capabilities include a complete set of creative editing and retouching tools, outstanding RAW processing quality, and an extensive library of customizable presets that include authentic analog film looks. Full-featured organizing tools -- collections and smart collections, keywords, virtual copies, and more -- make it the ideal photo management solution. Its catalog-free approach provides photographers with a fast, intuitive approach to their organizing work. Photographers can also use Exposure as a creative editing plug-in with other editors such as Adobe Photoshop and Lightroom. Exposure X4.5 is available now from www.alienskin.com for $119. It is free for current owners of Exposure X4. Upgrade pricing is available to owners of previous versions of Exposure for $79. Exposure X4.5 is also the central app in the Exposure X4 Bundle. This integrated collection bundles Exposure X4.5 with Alien Skin's award-winning Blow Up and Snap Art tools to add high-quality image upsizing and natural media special effects. It is available for $149. It is free for current owners of the Exposure X4 Bundle. Owners of one or more of the current apps in the Exposure X4 Bundle can purchase it for $89. Alien Skin Software makes creative tools for photographers and graphic designers. The company distills advanced math and cutting edge research into creative tools that help photographers and designers bring their vision to life. Alien Skin Software's reputation for bug-free software and friendly tech support has grown worldwide since its founding in 1993. For more information, visit the Alien Skin website at www.alienskin.com. Exposure, Snap Art, Blow Up, Eye Candy, Alien Skin Software, and the Alien Skin Software logo are registered trademarks of Alien Skin Software, LLC. All other trademarks are the property of their respective owners.